This is a fairly long posting, expanded from a recent set of e-mails. There has been some discussion (Kevin Smith / Ken Cook / Neil Peterson and myself) of the framework for the Thanksgiving smelt. For those keenly interested, this will be at Wareham Sunday October 12. As regular readers may remember, the DARC smelt team is working towards a full reconstruction based on the evidence from the Hals site in Iceland. The excavation work is being done by Kevin Smith (reference : 'Ore Fire, Hammer Sickle : Iron Production in Viking Age and Early Medieval Iceland') An earlier discussion - 'Towards an Icelandic Smelter'. Possible layout for the furnaces at Hals based on remains. The sod construction represents a major logistics challenge at this point. We need a skid of grass sod (hopefully donated). Time is too tight to set this up for this Thanksgiving. I also think there are a number of other pieces to work up before we go that full construction. 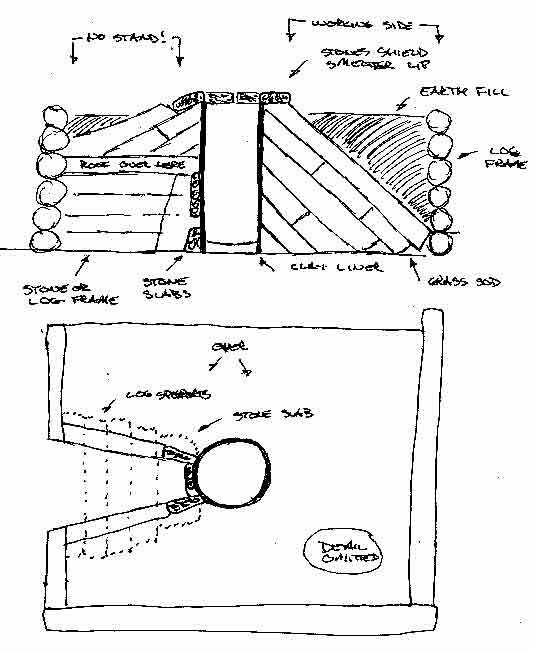 We can certainly use an earth banked design which will allow us to test a number of the other elements. Use of the thin liner should represent a major test on its own. The simple way (see below) would be to dig a cylinder into our pond earth bank for the smelter, then line the dirt with the thin clay. We will have to substitute straight ball clay for marl - as we just can't GET any marl / 'glacial blue clay). I did read in Pleiner (someplace?) about furnaces that were simple cylinderical holes cut into the ground near the edge of a natural bank. Then lined with a thin) layer of clay as fire proofing. (I think these were English / Anglo Saxon??) The evidence from Hals does not appear to give us either the thickness, or mixture of this suspected clay liner. Kevin Smith has suggested 2 - 5 cm. I suspect you would want to use the horse manure cobb here. The work dynamic of the Icelandic is the easiest thing to work on right now. Ken and I talked it over, and we think we can 'fake' this out by digging a key hole into the side of the pond bank (more details below). This would let us use the upper ground level as if it was the top of the sod construction., blocking out the 2 metre square working platform. Now this would require us to undertake all the physical adjustments to the smelt bowl working down a roughly 1 m long slot. I think we should also fake the position of a man powered bellows by placing a plywood cut out, but at this point still use the blower air system. This should definitely be one of those 'rake the sand' experiments to look at work and debris patterns. Now, we did mess with the stone slab construction for the Thanksgiving and Fall smelts of 2007. The first of these we did try to use the 'blow tube' style tuyere (tuyere set back from blast hole), but with poor results. The use of a stone front on the smelter (or entire stone construction) has been tested to success. My own interpretation of the layout from Hals leads me to believe you would want to(ideally) construct the smelter with a stone slab set above a clay bellows plate. Our own tests certainly suggest that any stone used in this fashion will bear significant and distinctive patterns. Kevin Smith has reported "We do have a small number of spalls with slag that could make sense from a similar use. ", from a discussion on our results from the October 2007 smelts. What about the use of a separate clay bellows plate? This represents both an archaeological question at its core. Again, there appears to be no specific artifact evidence, but this is balanced against the relatively fragile nature of these plates. Does the evidence indicate STONE used as the front section of the smelter around the tuyere? . What about the use of a separate clay cobb 'plate'? A number of smelts (mainly Nissen) have shown that a roughly 15 x 20 cm by 2 cm thick plate of dry horse manure mixed with clay works extremely well. The third piece of this method is the set up with the tuyere actually sitting proud of the smelter wall. I did use the combination of bellows plate (thin plate around tuyere entry) with blow tube set up at Smeltfest 08 for two smelts with good results. Also watched this done three times in Denmark. So taken together, I'm pretty sure we can get this to work. We do need to tweak the mix on the DARC Dirt. Due to bad communications (and poorer math!) the actual iron content of the first round of test materials was really on the low end. It did match the St Lunaire samples, but ideally I'd rather bump up the iron content to something richer and more likely to give higher end yields. Given time and supplies, it might make more sense to use a richer ore body for this next experiment. We also should try to match the ore content from Hals if at all possible. 2) Use a thick walled clay cobb furnace structure. 3) Set up the work area with a fresh sand base. B) Use blow tube arrangement for the tuyere (which can quickly be modified to our normal insert tuyere if required. This suggests to me one minor (number 1) plus two major changes (A / B). I have worked both A / B, and 1 is more a modified work dynamic than an actual major change. The set up of the furnace with only a small tap arch down a slot certainly leads to a top extraction. To that end we should aim for a 3 - 5 kg bloom.